Got on a plane Sunday night in Los Angeles and landed in Brisbane on Tuesday morning. After a rather close connection in Brisbane thanks to a slow immigration/customs process, I landed in Townsville in Queensland. Guide Clint Isaac picked me up at the airport and we drove an hour south to a river where fellow guide John Campbell was waiting with a boat. I met both those guys when they were guides on a Great Barrier Reef trip I took a few years ago with Nomad. We started off casting plastic prawns into fallen trees and mangrove roots. After shaking the rust and jet lag off of my casting I was able to get some bites but did not manage to hook up. After a couple of hours I finally landed a Barramundi of about 4lbs. 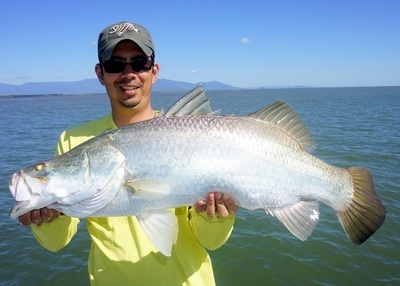 That was my first Barramundi so I was stoked. They look and fight a lot like a Snook. 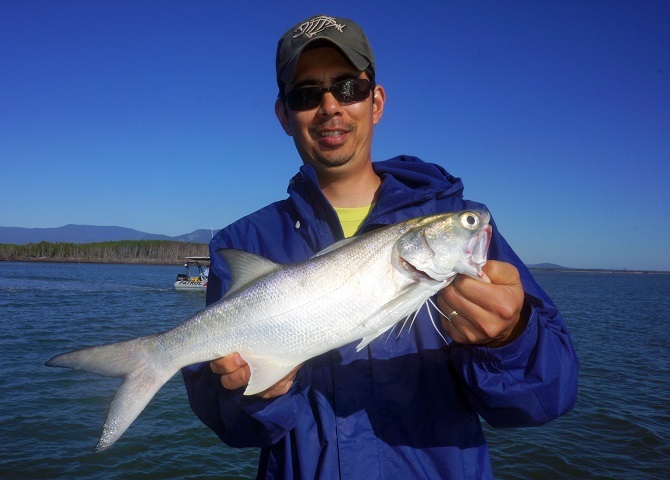 Later in the day I got a small Giant Trevally, an Australian Blue Salmon, and an Australian Tarpon. The Tarpon there look and act just like the Tarpon in the US, but they only grow to around 6lbs or so. They are a fun little fish on light tackle. As it got dark we headed back to John’s house where I stayed for the week. John lives in Ayr, which is a small sugar cane town. 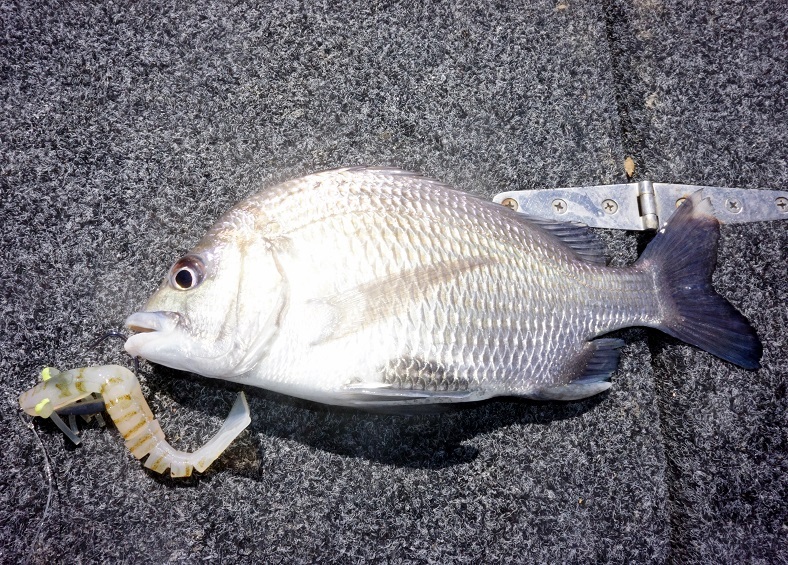 Lots of people fish in the area, but fortunately the vast majority just soak bait. I don’t think I saw anyone casting a lure all week. I also saw almost no women; interestingly that town has something like a 7:1 male:female ratio. It was kind of weird. 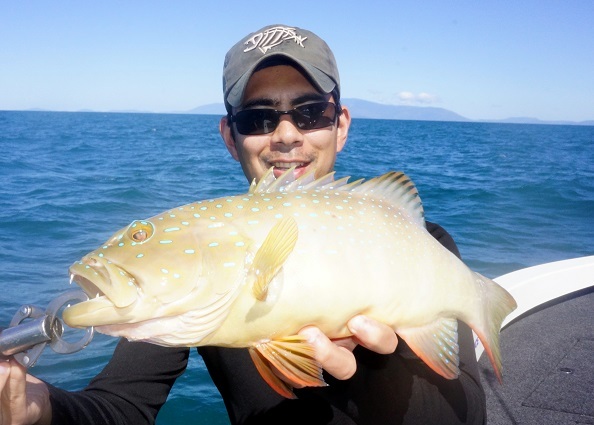 The area has a lot to offer in terms of fishing variety though, and I got to sample a lot of that during the week. 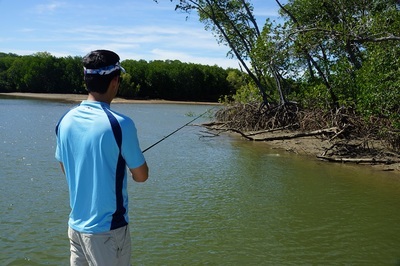 We headed out of the mouth of a different river and started jigging plastic minnows over sunken trees. 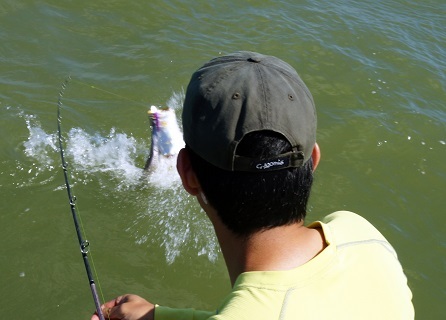 On the first drop my lure stopped and ZZZZZZZZZZ a heavy fish headed for cover. Fortunately there was a fairly heavy current and we drifted away from the tree pretty quickly. As my line started to run out and I started to worry that the fish would make it into cover I tightened the drag a tad. Seeing that the fish was not slowing down and I was running out of line I tightened it again as tight as I dared with the light spinning outfit. Finally I was able to turn the fish and get it heading in my direction. 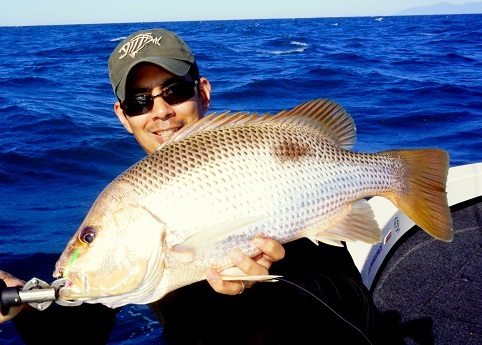 After a few shorter runs the fish came to the boat but it was touch and go for a while there. It ended up being a 20+lb Golden Snapper or Fingermark as they call them on the East Coast of Australia. Everybody was pretty excited as that is a trophy fish for that species. Next drift I hooked an 8lb Fingermark which we kept for dinner. We didn’t eat it until the next day but it was still delicious. On the third drift I hooked another heavy mystery fish, but by this time I had upgraded my gear and felt more confident about getting it in. 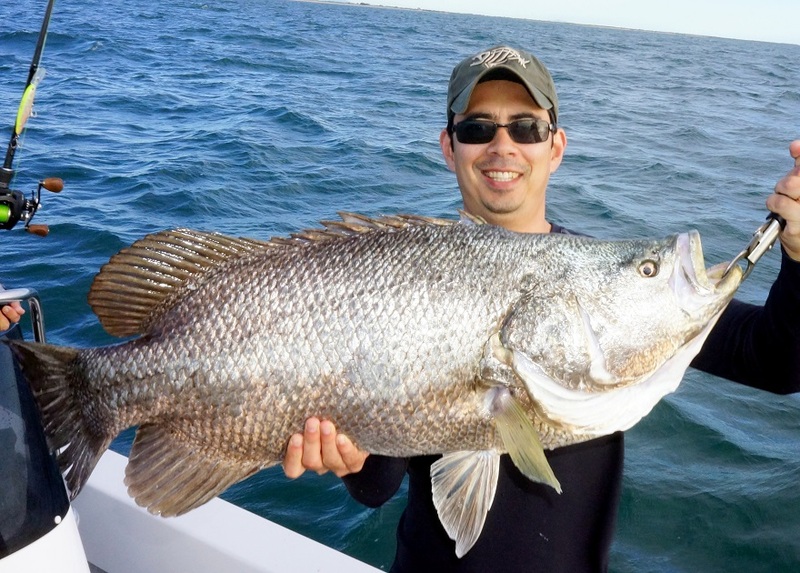 After a bulldogging fight a large Tripletail came into the boat. Clint and John were stoked as that is a pretty rare catch especially at that size. Two trophy fish in the boat and it was only 7:30am. Unfortunately it slowed a bit after that. I missed a couple of bites and got cut off by a couple mystery fish (probably mackerel) and then we headed into a creek to try for barra again. I got another Australian Tarpon and missed a few bites and finally found a bunch of barra schooled up against a bank. When the current started running they were biting on every other cast. Unfortunately it took me a little while to get the hookset right because the rapid current created a lot of slack and they would just bite the lure and then drop it without running anywhere. 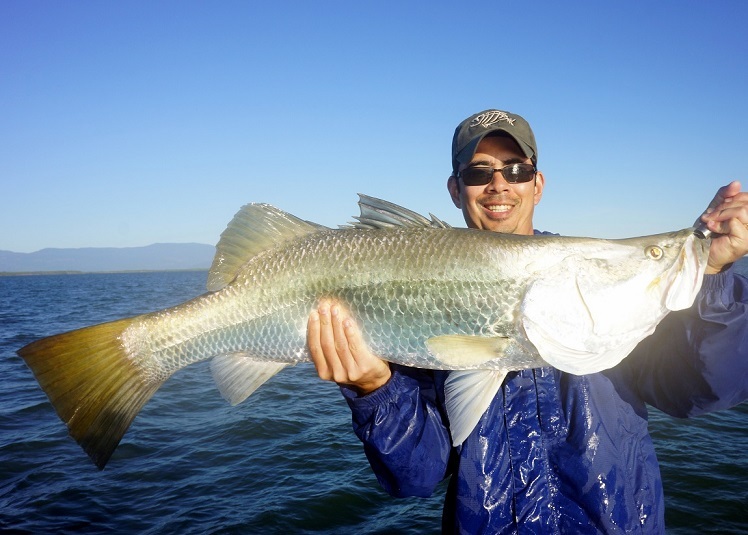 However, once I got it figured out I boated around 15 Barramundi from 3-6lbs. They put up a strong fight on light tackle and make some nice jumps. 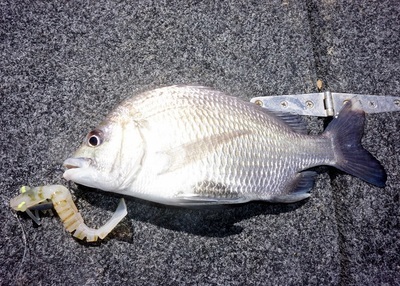 I also got a couple of Australian Bream as a bycatch. Very good day. We started out farther offshore jigging plastics over some rocks. Five nice Fingermark made it to the boat in the 5-10lb range. While fishing for the Fingermark we spotted a small marlin swimming around the boat. I cast a plastic minnow out in front of it and it grabbed it eagerly but did not hook up. I cast again and it followed the plastic to the boat but did not hook up. Oh well. It was cool to see. 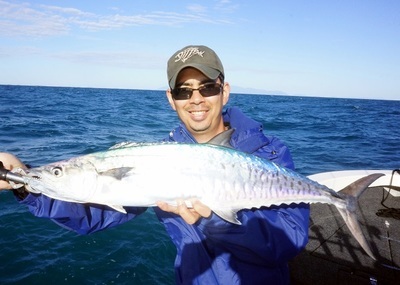 I got a couple of Spanish Mackeral on the way up and then we moved inshore to try for some bigger Barramundi. 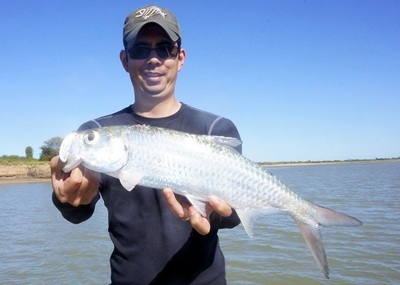 We found a school of big ones near the river mouth and I started casting a plastic minnow into the muddy water. There was no evidence that there were any fish there - no splashes, no birds, no bait - but the sounder said they were there so I kept casting. Finally after about 30 casts to the same spot I got a solid bite and hooked up. The fish didn’t seem to know it was hooked and swam calmly towards the boat. Then it woke up and made a long run under the boat. It felt like a large fish but unfortunately after about a five minute fight the hook pulled. I was pretty disappointed because you only get so many shots at large fish. 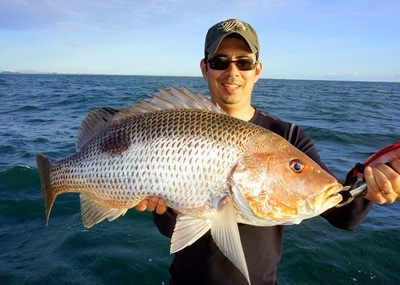 After that the fish scattered a bit so we slow trolled the area while snapping the rod and adding lots of pauses where we thought the fish were. I hesitate to even call it trolling; we were out of gear and just twitching the lure in the hole where we though the fish were. On the first pass I got another big hookup and the fish stayed hooked. 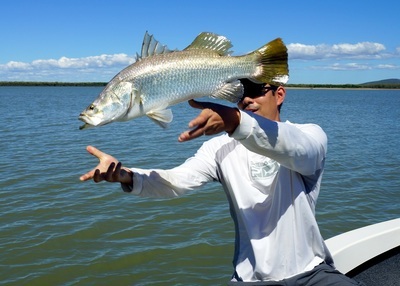 After a good fight with a lot of long runs a big barra made it to the boat. High fives for all; that was the fish I came to Australia for. 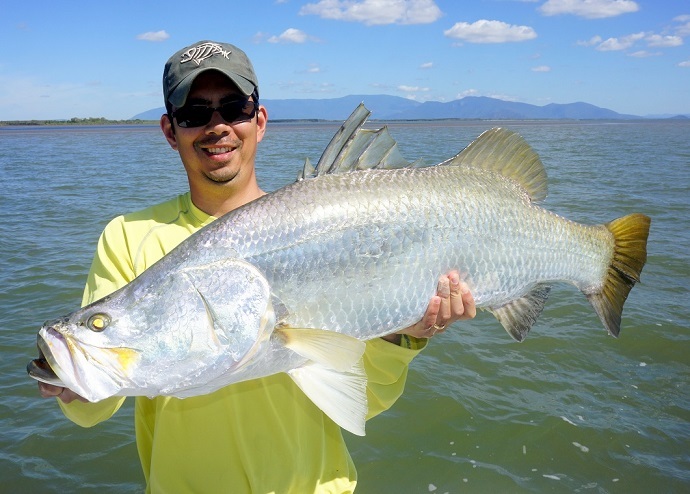 We started out checking out the same area that produced the big barra the day before. Right off the bat we got a big bite and the fish made it to the boat. High fives all around and another pass or two and another hookup. The big fish were on fire and we ended up with 4 big ones in the boat and a couple lost. These were all trophy fish and I couldn’t believe I got that many shots at them. Everybody was stoked. Once the tide changed and the bite shut down we headed in and switched to a smaller boat and went to a small lagoon near John’s house. There were some fish surfacing and it looked promising. I got a small tarpon and got a couple other tarpon hits. I switched to a Zara Spook and BOOM a big barra comes up and nails it. It jumped around the little lagoon and I was wondering how I was going to land it. It turns out that I wasn't. I could feel a bunch of weeds dragging on the line and then the fish threw the hook. We tried for a while after dark but it shut down so we went home. We started the day out in the ocean near a big rock near shore. Casting big jerkbaits I hooked up a big queenfish. Queenfish are one of Australia’s finest gamefish – they hit all kinds of lures, pull hard, and jump. Really fun fight. 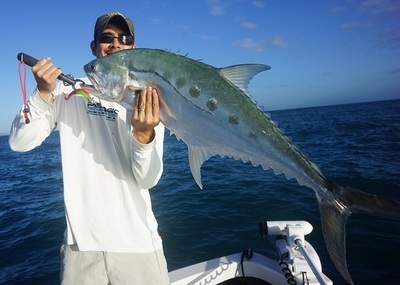 I kept casting around the rock for more bites and a few more fish in the boat and then they wised up so we headed over to a spot near the rock and jigged a plastic and landed another big Queenfish. 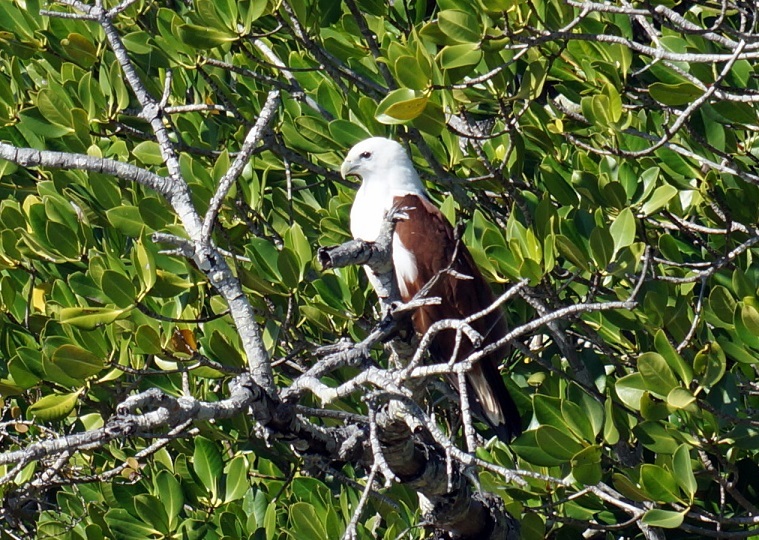 We then went into a creek to try for Mangrove Jack. I cast like crazy at every possible twig sticking out of the water but the Jacks were not biting. 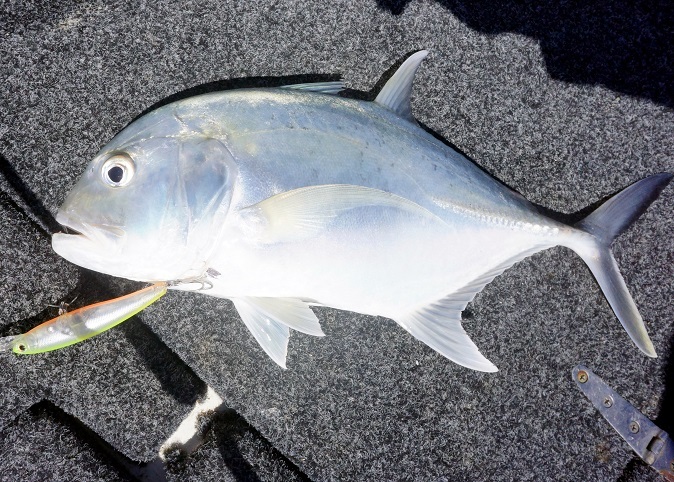 I got a small Giant Trevally and a few tarpon and a nice Blue Salmon on a Zara Spook but the Jacks did not bite on either side of the tide. Oh well, I had caught them before and wasn’t all that focused on them. 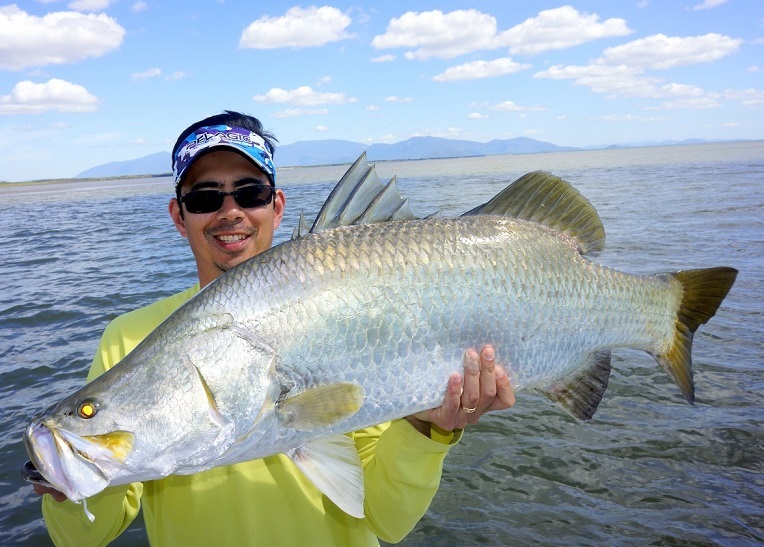 The wind really picked up a lot which ruled out trying for the big Barra so we went back to the Queenfish spot. Thankfully they were willing to play on both poppers and stickbaits. They were even bigger than the day before and pulled really hard. I got a pretty good workout in just a couple hours on medium spinning gear. I switched to jigging when they shut off and got a couple more. While releasing one of them an enormous barracuda came right up to the boat. It looked like it was trying to decide whether to try to eat it. I dropped a jig in front of it but it ignored it and slowly swam off. It was much larger than it looks in the video. 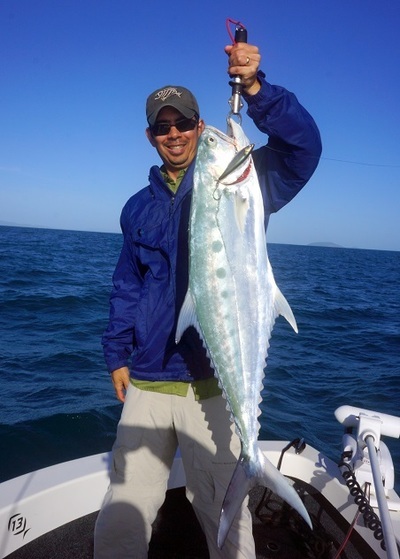 I tried jigging some more and had some enormous Queenfish follow it all the way to the boat but no more bites. We headed in around 9:30 so that the tide would not strand us outside. I opted to relax for the rest of the day before starting the long journey home. 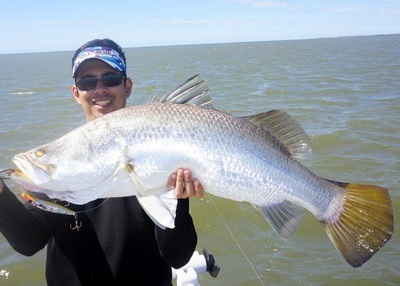 This was a really good trip for sampling a variety of techniques for a variety of inshore fish. I highly recommend John and Clint as they are very accommodating to whatever the client wants to target and very knowledgeable about the fishery. 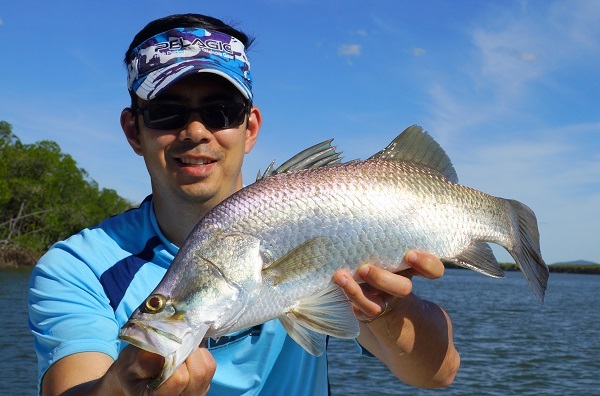 Five trophy Barramundi would have been a good trip by themselves, but the Queenfish, Fingermark, bonus Tripletail, and other species really made it a great trip.